On 7th April, founding director Peter Denton will be retiring from Williams Denton Cyf after 34 years in the saddle! To mark this momentous day, he is literally getting on his for a sponsored cycle ride from Bangor pier to Williams Denton in Llandudno to raise money for Home-Start Conwy and Prostate Cancer UK. Williams Denton was delighted to support The Gwynedd and Anglesey School Sports Awards, celebrating the achievements of pupils, coaches and volunteers throughout the area. As one of the sponsors of the annual ceremony, Williams Denton attended Beaumaris and District Leisure Centre to celebrate the achievements, success and good practice initiatives in schools over the past year. Hosted by television presenter Nia Parry, more than 200 guests attended to witness the presentation of 13 top awards. Assistant manager of the Welsh national football team Osian Roberts was the special guest of honour which delighted the many young sports enthusiasts in the hall. 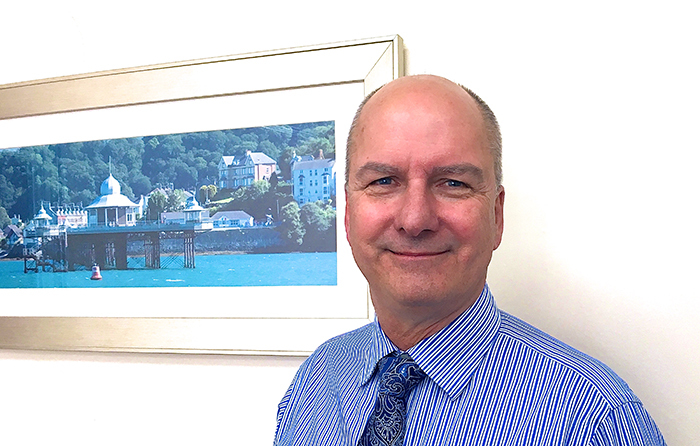 Keith Barker, Bangor-based director of Williams Denton, said, “It was a great pleasure for us to support this outstanding event which rewarded so many high achievers in the north Wales area. Adam Owens of Williams Denton made the headline speech at the launch of an innovative new business resource at Llandrillo Menai. 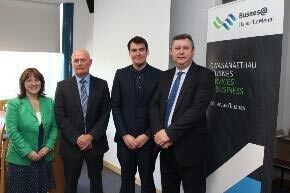 The breakfast event to launch Busnes@LlandrilloMenai included a series of briefings on current challenges and opportunities for businesses in North Wales. Adam, a former Coleg Llandrillo student, gave his presentation on the pressing issue of pensions auto-enrolment. In it offered essential information on how to comply with new legal requirements for workplace pensions, and the significance of staging dates. Busnes@LlandrilloMenai has been established to support employment and economic growth in the region. It aims to bring together a range of existing and enhanced training, to include a package of short courses, based on a series of hubs covering key sectors, from food to forestry to social media. It will also provide a gateway to part-time professional and work-related programmes, varying from essential skills to degree level. For more information on Busnes@LlandrilloMenai go to www.gllm.ac.uk/busnes or call them on 08445 460 460 (for Welsh speakers) or 08454 50 59 60 (for English speakers). Dispensing GP practices are being offered expert VAT advice in a workshop led by Williams Denton director Janet Jones. Janet, who is based in the Llandudno branch, specialises in accounts for medical practices and has a wealth of experience in all forms of accounting for GPs. The session, which will be held in the Bangor office of Williams Denton, takes place on May 20. More information is available by contacting Williams Denton on Llandudno 01492 877478 or Bangor 01248 670370. Those unable to attend can also email Janet to receive a copy of the slides at janet@williamsdenton.co.uk. While retirement usually means time to take things easy, Sylvia Jones from Williams Denton in Llandudno is marking her final day at work hurtling through the air at 70 mph with a high-flying fundraiser for Wales Air Ambulance. Sylvia, who has worked with the firm for 45 years, is being sponsored to take flight on the Zip World Titan at Llechwedd Slate Cavern on March 27. There’s just one problem, she has a long-standing fear of heights. 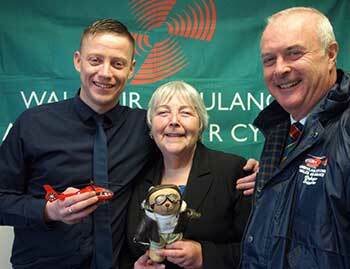 Sylvia, who will be joined by her colleague Craig Bisby on her high-flying adventure, hopes to raise £500 for Wales Air Ambulance. 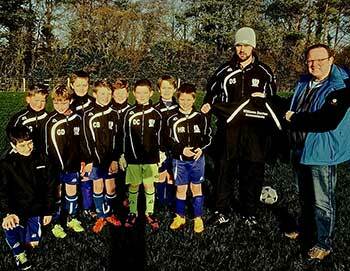 Holyhead Hotspurs Peibio Youth FC Knights team under-11s have a new training kit, thanks to sponsorship by Williams Denton. The smart new kit has helped the team train more efficiently and the team’s coach Devon Shaw is hoping that in turn will add up to some more winning performances.